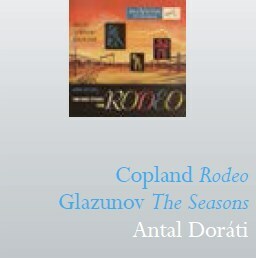 A small amount of caution is necessary here, given the extent and the breadth over many years of Doráti’s discography. These recordings come from sessions made in 1946-47 with the Dallas Symphony. They were recorded in State Fair Auditorium in the city, the Glazunov Seasons being the first to be set down, in January 1946, and the Copland following just over a year later in February 1947. Both were issued by RCA Victor. Despite a somewhat flat aural perspective without a great deal of spatial depth, both performances score highly on the interpretative meter. Doráti was, as everyone knows, a consummate ballet conductor and you’d be hard pressed to find someone less likely to mess up these scores. Doubtless his sonically superior 1991 London/Decca recording of Rodeo, which was coupled with El Salón Mexico, Appalachian Spring, the Fanfare et al far outclasses this Dallas performance in that respect alone but there is something undeniably snazzy, sizzly and exciting about this pioneering 1947 recording. It has tang, and it has atmosphere, the flute in the Corral Nocturne being especially effective. He gets the fiddles to thin their tone in the Saturday Night Waltz – nothing too plush allowed – and this homely feel is also audible in the mordant wit of the Hoe-Down. There are a couple of cuts in Glazunov’s The Seasons made in order to fit the music onto the requisite number of 78 sides - a small disappointment, but not a major one. Here too Dorati gets the colour, the ice and the burnish of the music just right. The Dallas string section doesn’t have the heft of some others but its wind players are felicitous and subtle – that principal flute again, to the fore: who was he? - and they shape their lines excellently. Each season has its pleasures, whether it’s the vitality Doráti engenders in Spring, the principal clarinet’s excellent roulades in Summer, the vibrancy of the Bacchanale or the lovely Adagio of Autumn. The transfers have captured the sonic spectrum well though the side joins are more noticeable because the shellac hiss stops and restarts again after the join. Again that’s quite a smallish point. The production from the Antal Doráti Edition is spare with track listings and no notes but these are all described as first CD releases – and if so then that’s a real cause for celebration.